From April 23-26, 2015, art enthusiasts and industry insiders convened at Pier 94 in Midtown Manhattan for Artexpo New York. The annual art fair has a long history, regarding itself as “the world’s largest fine art trade show for 37+ years.” It is also one of the few art fairs in existence that offers artists the opportunity to exhibit their work without gallery affiliation. Buddhist philosophy teaches that if you show intent, then the universe will open up to new opportunities. 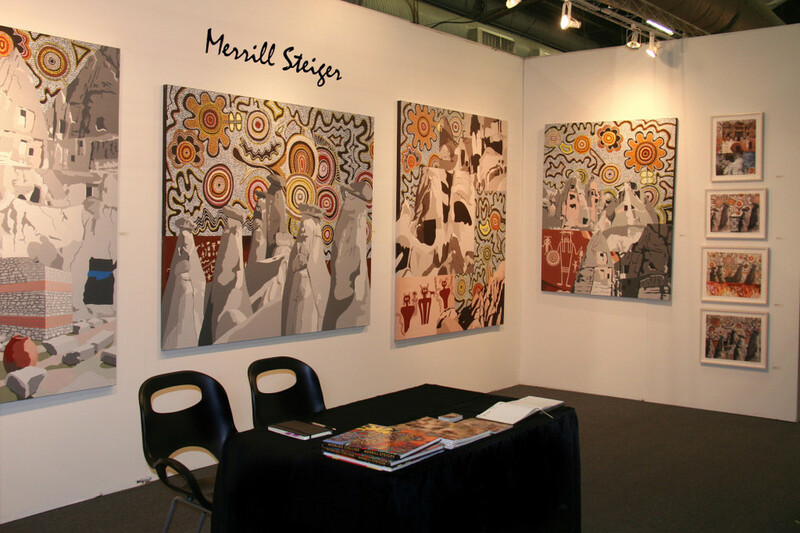 Although they can be a large investment of time and money, art fairs are an excellent way to gain exposure for your work, offering the public and professional art world a glimpse at what you’ve been producing. You never know when the right person might come along who could offer you a solo show or purchase one of your pieces. Preparation is especially key to ensure that all your work is hung professionally and that you have all the relevant marketing materials (i.e. business cards, postcards, catalogs) available to your potential clientele. For Artexpo, I decided to exhibit Dreamland, my series from Worlds Collide, that merges the Aboriginal dotted dreamworld with the caves and rock formations of Cappadocia, Turkey. Over the four days, I met some interesting new people who engaged with the work including artists from around the world and Swedish gallery director Mickaella Himmelström-Jankowich of Svenska Konstgalleriet. This new connection has also opened up the potential for representation to show my work at Art Monaco this summer.